A big weekend for a little border collie (and a Lumen). Our first overnight trial. It was a nice one because they started at 12.30 on Saturday which meant we didn’t have to get up at 5.30am to get there. Yay! It was super humid all weekend with thunder rumbling away in the distance for most of it. Luckily none of my guys mind thunder so it didn’t really affect them. Though, the heat absolutely killed Lu, she doesn’t do heat, nope. Loki’s runs on Saturday were…. reasonable. He knocked about 4-5 bars per run. He looked like he tried to adjust on the DW, and he missed his weave entry but once we tried again he weaved beautifully. Here is a video of him going very fast and knocking some bars down. Lumen had a run in masters jumping because I like the judge and it was a very fun course. People were doing all sorts of things – threadle tunnels, layering things, forced front crosses… because I had Lumen I opted for our Go-To handling style which is for me to run as fast as I reasonably can, blind cross everything where practical, and keep her in extension at all times. I actually managed to do handling completely different to anyone else I saw walking the course because they all wanted to go “COOOOOMMMEEEE’ into a tunnel, and I looked at that and remembered how Lumen thinks tunnel threadles are just the stupidest thing invented, so I ran really fast instead, looked over my shoulder and did a blind cross, putting me where I needed to be. No need for threadles. Hey! Here’s a video. Unfortunately I didn’t connect with her after that 2nd jump so she blew me off and went in the other end of the tunnel. Turning does NOT come easily to Lumen and she really, really needs my help in these situations. Other than that, not a bad run! Then we camped near this big, big lake! It was excitingly big because Australia doesn’t really have big lakes. This lake could have been in Switzerland. It was cool. Except there’s a lot of water in this whole area which meant a lot of mosquitoes. We woke up in the morning to the sound of buzzing as layer between the tent and the fly was COVERED in them. Eww. Then we went back for day two. Loki had mixed results. As in, at one point I was questioning whether he was at all ready to trial. With bars down, and in both agility courses not being able to get his weave entries, hit dogwalk colours or actually do anything that resembled the course. Oh he likes going very fast, but this is a problem when I need him to ACTUALLY PAY ATTENTION. His agility runs were a mess. But then the afternoon came and I decided to take a leaf out of Silvia’s book (explanation in a moment) and went in there calm and non-frazzled. His jumping run? 2 bars down. Not bad! His agility run? An acceptable dogwalk hit, still didn’t manage to get the weave entry, and only 2 bars. Otherwise a clear run. Of course, neither of these two-best-runs-of-the-weekend got filmed. But that’s ok. I remember when Silvia started trialling To she said that she basically stopped running – she wanted to make sure To wouldn’t drop bars so she could get out of A1. Now, look, I’m not necessarily in any rush to get out of Novice – though to be honest I think all the GO REALLY FAST IN STRAIGHT LINES AND DO WHATEVER IS DIRECTLY IN FRONT OF YOU!!!!!! is very much working against Loki in that whenever I DON’T want him to do whatever’s in front of him, he finds it very hard not to. But I did find that when it came to the home run of the jumping course, my instinct was RUN HARD, RUN HARD! But I told myself no, I was doing an experiment, don’t run hard. Take it easy. So I did, and the bars stayed up. I had some advice, too, from an old-school competitor that I shouldn’t do long leadouts with him because then he focuses on me, not on the jumps (after he misjudged his takeoff and crashed into the first bar of the course (here’s that video)) to which… I was not overly convinced. I actually think setting him up far from the first bar doesn’t work for him – it’s not like he needs a big run-up after all. As soon as I started setting him up closer, he had no trouble with that bar. Plus on the course I had to do with literally 5 jumps in a straight line leadout (including the spread – an obstacle I think he hasn’t NOT knocked so far…) he didn’t knock a single bar there (even the spread! Verbal praise galore!) because I WASN’T RUNNING. I took it easy. So maybe this is something. And I have to work on weave entries from stopped starts (tables, leadouts with a jump before, etc). These were very hard for us. Possibly any entries would be. But they were looking so so good at home. Oh! And I nearly got a pass with Lu but temporarily forgot where I was going so then I tried to push her back onto the right line and the bar came down. DAMNIT! It would have been our first excellent agility pass. Oh, and while I was waiting to run Loki, people started shouting “Loose dog! Loose dog!” so I looked around and there was a big orange bundling bundle of fluff. Apparently my senior citizen dog had done a jail-break when we weren’t there, smashed up his crate, broken out, avoided the people who tried to blockade and coral him (he’s too spry for them!!!) and found me all the way on the other side of the field. He was quite pleased. He got relegated to the boot (trunk?) of the car for the rest of the afternoon. Poor Malmal. Still, surely after so many years of competing, he knows how to be crated. I don’t know why he chose that precise moment to come find me. Weirdo. Maybe he wanted to relive his glory days. well, yesterday Loki popped his competition cherry. He is no longer a competition virgin. And he really did awesome. Being Loki, I could get him out of the crate SUPER early, so he had a lovely warm-up, we focused with plenty of tricks and went into the ring without him screaming or obsessing over any of the dogs before him. Which, I think meant he was lovely and calm going in. 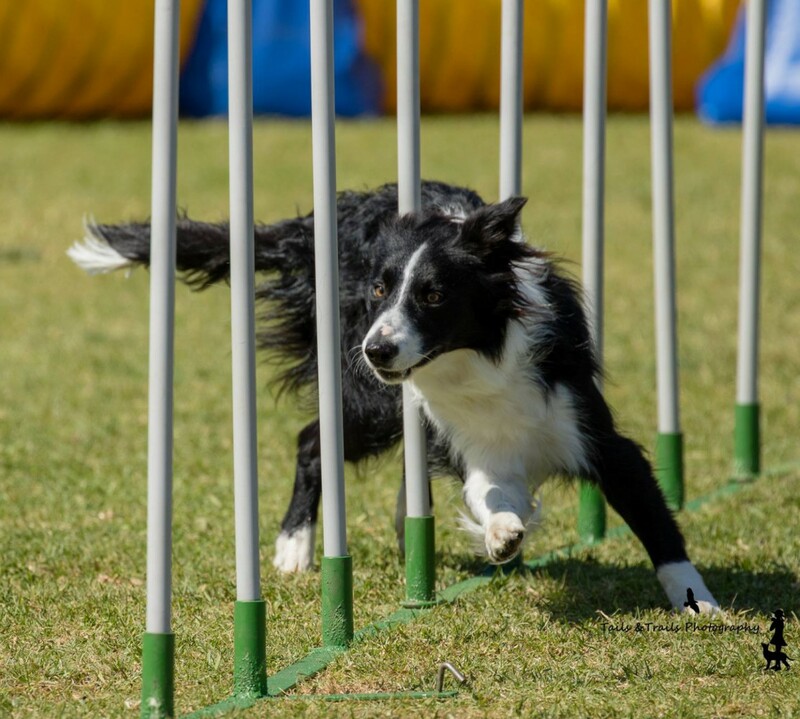 The first ring was novice agility but I knew his weaves weren’t ready and I still haven’t trained the table so I made up my own course – jump, LOOOOONG lead out, dogwalk, cap a bar, then run home. Well his stay for this run was pretty good… he didn’t hit his dogwalk but he seemed quite anxious running along it, and he missed the tyre on the run home. Oh well. Then we had jumping in the afternoon. His stay fell apart so I went back and reset him. He still crept forward but I tried to ‘proof’ him a bit and when he proved he could be solid I released. This time we did the whole course as you’ll see below. He felt much less frenetic than I had expected and although I rushed the spin after the tunnel, it felt VERY smooth and not at all as difficult as I was expecting. I don’t know why I was expecting difficult with him because he’s the funnest and easiest dog ever. Did I expect him to not push out as easily as he did? Did I expect him to knock way more bars? (yes) Did I expect him to feel out of control with increasing inertia as the course went on? (yes). And yet, none of those things happened. And it was lovely. In two weeks time we’re running again – two agilities, two jumpings. I hope I can get his weaves ready by then, and run him on some unfamiliar dogwalks, too. I’ve decided with Lu to just run her in agility for now, otherwise I have too many clashes (the next comp would have been 3 rings all at once. Two for Lu, one for Loki), her agility is where she needs the most practise, she gets tired and demotivated with too many runs anyway, and I don’t feel motivated to run HER once Loki is all finished up for the day. So 2 agility runs for her will be nice. Like I said on the video there, that’s the first actual running I’ve seen on the DW in a few months and is almost 100% for her. I’ve seen faster and longer when playing the 500 ball game, but this is pretty darn close. If she keeps running like this I’ll be very happy. And I was happy with her weave training there, too. She was hitting some nice entries, working pretty independently, getting confused about what to do when she’d finished the weaves (sigh). But she was pretty keen… I’ve found that getting her to ‘back up’ before doing anything helps sort of wind her up and she’ll automatically start with more speed than from a stay or a restrain. Now to teach her to back up from further away and in more of a straight line!! So glad to see him looking more confident along the WHOLE thing now – we’ve been working our way back gradually since his crash as he was quite anxious about the up-plank. But look at him go. What a little champ. Check out the separation on the last hit! If I can keep that going, woo hoo!!! I need to be mindful with Loki though that he lives for this work. I bet that if I’m not careful, I could end up training him to not hit well by ending the session on a beautiful hit like that. Cos he’d start to associate doing that with finishing. So maybe I need to get the good hits, then do something easy like some tunnels, and then finish. He’s not doing it now but I can imagine that it’s something his little brain would figure out. Maybe. But he’s such a good boy that I don’t know if he’d mess up on purpose – then he’d be failing in his duty as a border collie (something Penny said on the weekend that I really liked cos it’s so like that – they just want to do their very very best and if they don’t, they’re failing in their duty… poor little guys) and I don’t think Loki would set out to fail. Anyway, it’s something to keep in the back of my mind. I actually think Loki’s DW crash taught him to respect the obstacle a bit more – like, you can’t just spazz out and not be mindful of your legs, cos it can hurt! So you need to be THINKING and running. Although I don’t want him to crash and it was very scary, maybe it was an important lesson, too. But no crashes since then! Here’s a video from the weekend, too. Calf muscles injured further: 0! What a little legend! My beautiful girl was happy waiting for her run doing some happy tricks (back up, chomp, jump up on me with front legs) and played the raspberry-face game… I set her up, looked down the line tire-spread-jump-angled-jump, and took a deep breath as I remembered back 4 days ago to when she would run around the tyre in training. And off she went. I felt our connection all the way through – I handled how I wanted to handle, trying to give her as much information as I could on these big open courses… and she did it! Course time 38 seconds, she got through in 18. Woo hoo girlie! Next and last run wasn’t so nice- the course had some… weird… bits in it, and I wasn’t as focused as the course before (hey, she’d already exceeded my expectations for the day which was: “if we go out there and she enjoys herself and runs quickly I’ll be happy”, so I slacked off), but I did get to do a Lap turn into a tunnel (first time we’d done it over a bar before the turn, and first time doing it into the tunnel) and a rear cross that didn’t work so well because I was much more ahead of her than I’d planned to be. In the first run I spent a lot of time thinking about where my ‘virtual dog’ would be at any time, but I didn’t do that so well for the 2nd run. I think it showed. The connection just wasn’t there and, well, we didn’t do as well. I felt a bit rushed getting in the ring too which didn’t help. But I’m still happy- her attitute was fantastic. After the run – she actually left the ring and brought me her tug toy treat pouch. What?! It was super adorable- like she knew the routine even though it was only the third time we’ve done it.